The Naval Academy Chapel organ dates back to 1908. 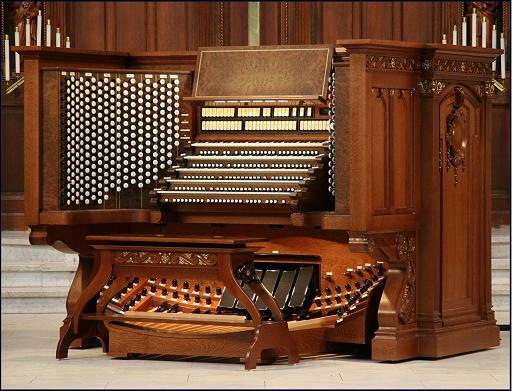 The Hutchins Organ Company of Boston, MA built the original instrument. In 1940, the Moeller Organ Company of Hagerstown, MD was contracted to build a larger instrument to support music in the newly enlarged chapel. Through the years, the organ has undergone several enhancements and renovations. Most of these enrichments to the instrument have been made possible through generous gifts of individuals and classes. The current instrument, comprised of both pipe and digital voices, totals 268 ranks and is controlled by two consoles. The beautiful sonorities that pour forth from this noble and grand instrument, range from the softest and most gentle tones to the regal and majestic sounds that are capable of filling the more than 2,000 seat Cathedral of the Navy. Organ console and tonal expansion paid for by a gift from the Class of 1951.